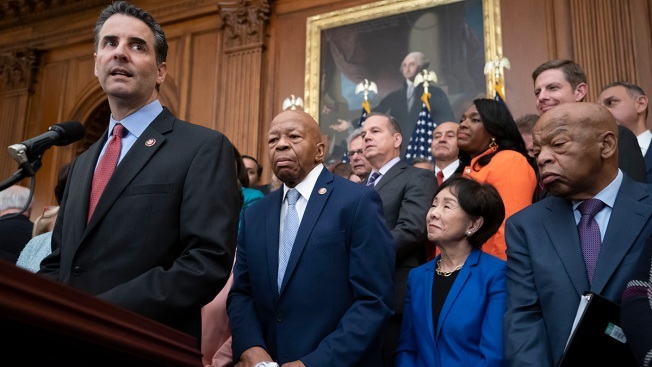 FILE - Rep. John Sarbanes, D-Md., left, chairman of the House Democracy Reform Task Force, is joined in front by, from left, Rep. Elijah Cummings, D-Md., chairman of the House Committee on Oversight and Reform, Rep. Doris Matsui, D-Calif., and Rep. John Lewis, D-Ga., as House Democrats, now in the majority, unveil a comprehensive elections and ethics reform package that targets what they call a "culture of corruption in Washington," at the Capitol in Washington, Jan. 4, 2019. Flexing their new majority, Democrats are moving to push through the House a comprehensive elections and ethics reform package they say will reduce the role of big money in politics, ensure fair elections and restore ethics and integrity to Washington. The legislation, called H.R. 1 to signify its importance, would make it easier to register and vote, tighten election security and require presidential candidates to disclose their tax returns. The sweeping, 570-page bill also would make Election Day a holiday for federal workers and require "dark money" political groups to make their donors public. And it would create a public financing system for congressional campaigns that Democrats say will cut down on corruption and reduce the power of lobbyists and other special interests. "The public is smart enough to know that where you get your money, that's where you get your marching orders," said Rep. Paul Sarbanes, a Maryland Democrat who is the bill's main author. "The public is saying, 'Build a system of financing campaigns that we own and we're in charge of,' not the insiders and the lobbyists," Sarbanes said in an interview. "We want to set it up so the public gives us our marching orders." Lawmakers began debate on the bill Wednesday, with passage expected Friday. Republicans call the bill a thinly disguised power grab that would expand government and use billions in taxpayer money to pay for congressional campaigns. Senate Majority Leader Mitch McConnell has pronounced the measure dead on arrival in the Senate, while the White House says President Donald Trump would veto it if it ever reached his desk. "This is a terrible bill," said Rep. Rodney Davis of Illinois, the top Republican on the House Administration Committee. "Who in the world is asking for taxpayer dollars to go into congressional campaigns? 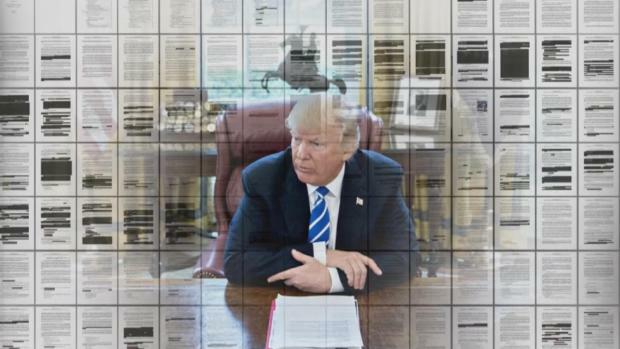 That's what Democrats are trying to hide in this bill." Democrats deny that and say money for political campaigns would come from a surcharge on federal settlements made with banks and corporations that run afoul of the law. "A lot of interests that pay for campaigns now are the same ones that lean on the policy-making machine in Washington," Sarbanes said. "If they do something wrong, then that's the perfect place to go for money to empower everyday Americans to construct a new system that gets out from under their influence." This bill allows "everyday Americans to become power brokers" with small contributions of $50 or $75 that will be matched at a 6-to-1 rate by the government, he said. Republicans warn that the price tag could run into the billions and say the legislation amounts to a federal takeover of elections. The bill would create automatic national voter registration while expanding access to early and online registration. It also prohibits voter roll purges like those seen in Georgia, Ohio and other states, restores voting rights for ex-prisoners and increases federal support for state voter systems, including paper ballots to prevent fraud. "This new House Democrat majority's top priority is apparently assigning themselves an unprecedented level of control over how they get elected to Washington, D.C., along with ... what American citizens are allowed to say about it," said McConnell. The Kentucky Republican, a longtime foe of public financing, mocked the bill as the "Democrat Politician Protection Act" and said Democrats were "intent on fixing our elections, even though they aren't broken." Among the flaws in the bill, McConnell said, is that the disclosure requirements for political donations would curb Americans' First Amendment rights by making their private information public. McConnell found an unlikely ally in the American Civil Liberties Union, which warned in a letter to lawmakers that the bill's disclosure requirements could harm public discourse "by silencing necessary voices that would otherwise speak out about the public issues of the day." Fred Wertheimer, president of the advocacy group Democracy 21, called those concerns overstated, saying the bill takes needed steps toward accountability and transparency. Wertheimer called the bill "historic legislation" that would put in place a host of reforms that would begin to "fix a broken political system and a corrupt campaign finance mechanism" that threatens our democracy. "The American people truly believe the system in Washington, D.C., is rigged against them and they're right," he said, adding that the bill would "end the use of political money to benefit funders at the expense of ordinary Americans." While Senate action is unlikely, Democratic Sen. Tom Udall of New Mexico is expected to propose a companion bill next week. The bill has drawn favorable responses from all six senators seeking the Democratic nomination for president, a fact Sarbanes said highlights its importance even if it never reaches the Senate floor. "This has an opportunity to become the defining brand of the Democratic Party," he said. "We are the party that stands for reform, we are the ones fighting to protect democracy and end corruption. That's a message we can lean on" in 2020.